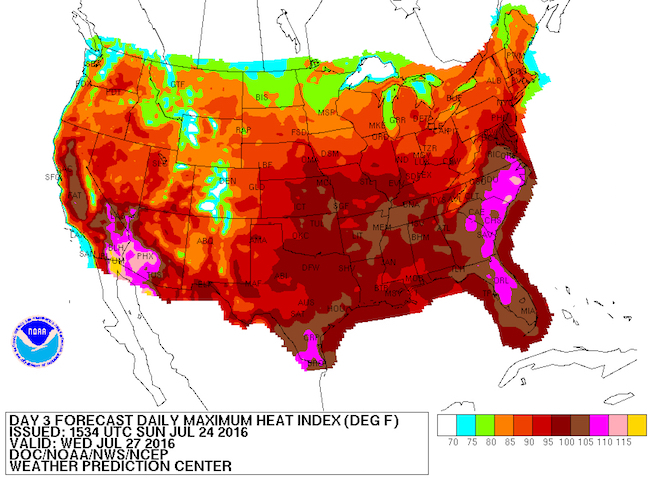 With the National Weather Service warning of “dangerous heat and humidity” across a huge swath of the country this weekend and for several days to come – including some heat-index readings over 100 degrees from the central to eastern U.S. – it’s a fitting moment for another of TCN’s occasional updates on recent high-temperature records. Here’s a rundown on the latest hot-weather climate records and some other – still potential – records that look like they may be in the making. Warmer to much-warmer-than-average conditions dominated across much of the globe’s surface, resulting in the highest temperature departure [from average] for June since global temperature records began in 1880. This was also the 14th consecutive month the monthly global temperature record has been broken – the longest such streak in NOAA’s 137 years of record keeping. If it’s any consolation to the heat-weary, June’s temperatures weren’t nearly as much above average as the first five months of the year. But that was no solace to experts looking at the world’s longer-term warming trend. NASA chief climate scientist Gavin Schmidt said the first six months of the year were not just the warmest on record, by far, but 2.3 degrees warmer (1.3 degrees Celsius) than the last two decades of the 19th century. But more importantly, he said 2016 so far is about 2.7 degrees warmer (1.5 degrees Celsius) than pre-industrial times. That 1.5 degrees Celsius mark is key. A December 2015 international pact to control global warming set a goal of avoiding 1.5 degrees Celsius warming above pre-industrial levels. And the agreement says if Earth can’t limit global warming to 1.5 degrees, at least it should limit it to 2 degrees (3.6 degrees Fahrenheit) above pre-industrial levels. The United States was example of the exceptionally warm conditions in many locations – according to NOAA, last month was the warmest June on record (dating back through 121 years of temperature readings) for the contiguous 48 states. The nights will be especially stifling, with temperatures hovering above 75 degrees Fahrenheit overnight; a few locations may not drop below 80 F. Such warmer nights make it more difficult for the body to recover from the high heat of the day, and raise the threat from heat related illness. Some locations in Texas have been experiencing overnight daily-minimum temperatures this month that suggest those places could set new records for their highest nighttime low readings in July, according to data provided to Texas Climate News by John Nielsen-Gammon, the Texas state climatologist. Through July 19, four Texas cities – Houston, Corpus Christi, El Paso and Midland – had average nighttime lows that were warmer than their respective records for their nighttime minimums for the entire month of July. Austin and Brownsville, meanwhile, had average lows through July 19 that were those cities’ second warmest overnight low averages, compared to their month-long records. Across the state, however, including daytime high temperatures, as well, Texas’ conditions this month “seem warm but not exceptional (yet)” compared to month-long July records, Nielsen-Gammon said. It was a historic day in the annals of meteorology on Thursday, July 21, 2016 in the Middle East, where the temperature in Mitribah, Kuwait, soared to an astonishing 54 degrees Celsius (129.2 F). If verified, this would be Earth’s hottest temperature ever reliably measured outside of Death Valley, California, according to Wunderground’s weather historian Christopher C. Burt. The temperature is likely to be verified, since Thursday’s incredible heat also extended into Iraq, which set their all-time heat record: 128 F (53.4 C) at Basrah. “What we’ve seen so far for the first six months of 2016 is really quite alarming,” David Carlson, director of the WMO’s Climate Research Program, told a news briefing. “This year suggests that the planet can warm up faster than we expected in a much shorter time….We don’t have as much time as we thought” to implement the international pact to reduce climate-warming pollution that was forged last December in Paris.